Like the title i can seem to get the hevc encoder to appear on the list. Edited by Keltere, 30 December 2018 - 08:59 AM. No, that is for decoding HEVC/H.265 and not for encoding. Notice the text Preferred Hardware Decoders. Decoding is used to decompress the HEVC/H.265 video so that it can be encoded to H.264 faster. Edited by Charlie117, 30 December 2018 - 09:04 AM. Yes, after linking i saw my mistake. Anyway do you know why i can't decide the hardware decoders? 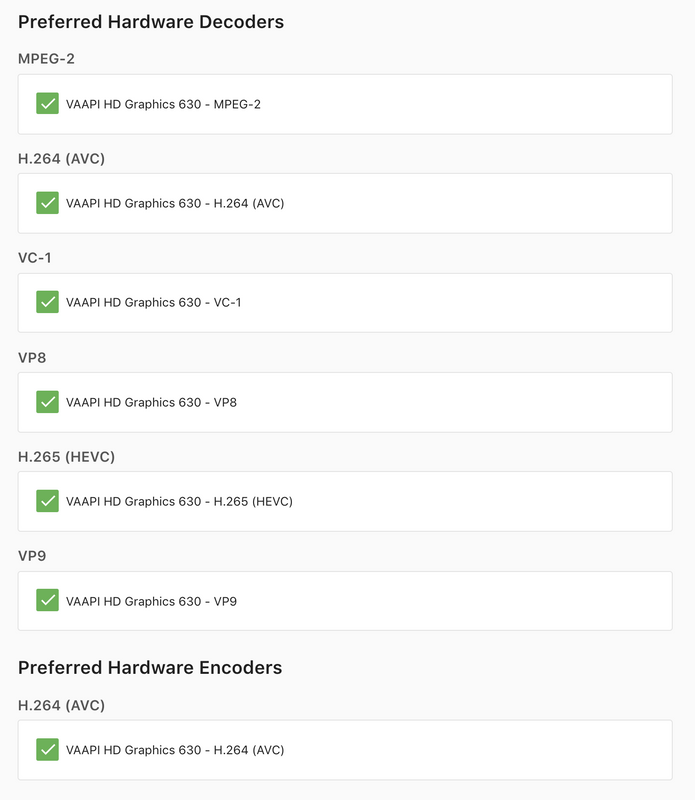 What do you mean you can't decide hardware decoders? Do you not get the same checkboxes like I do in the screenshot? Edited by Keltere, 30 December 2018 - 09:29 AM. Can you please attach the emby server log as well as the hardware detection log? Thanks. Ok, so alucryd hasn't gotten these changes in yet. We should have this resolved on the beta channel soon. Thanks. Thanks, it's a remote server, i don't have the possibility to change it right now. In future i will migrate to another distribution. Arch is really unreliable even without using AUR. I think i will go with the good old debian. Sorry if i ask but do you heave any suggestion? Thanks, i will hope that this changes will enhance the performance. OK regarding betas on arch linux, what you are installing is a package that is being put together by a community member, and as a result it does not have some of our customized components. This week we will start producing our own official beta downloads for arch linux. It won't be in the official AUR repository, just the stable release. Once we make this available I would recommend switching. If you want to continue using what you're using, then you'll need to roll back to ffmpeg 4.0.2, and you'll also need to be aware that these kinds of dependency problems may continue to happen in the future. Thanks, sorry but i didn't understand. I've downgraded the ffmpeg to 4.0.2 but i still can't choose the decoder hardware. Is that related to the missing customized components? Edited by Keltere, 01 January 2019 - 06:38 PM. Yes exactly, you're not going to get all of our new features using this community package. Sorry to bother but where it will be released? I mean where should i check for the release? The official archlinux thread? Edited by Keltere, 07 January 2019 - 12:10 PM. It will be for download on our website. The new stable release is coming very soon though. Thanks. @Luke any news on the arch version? Yes it should be available by the weekend. Thanks.